A few weeks ago I was watching a documentary on TV in which a doctor said that people with a very low amount of salivary amylase should consume much less starch because it will cause them to have blood sugar spikes. This confused me because I would have thought that if a person has less amylase to convert starch into sugar, they will be able to consume more starch, not less. Does anyone here understand why the doctor said what he said? It is actually a tad complicated. The Breslin group has shown that a group with higher amylase concentration had lower blood glucose responses. They speculate that this is due an earlier insulin response leading to an attenuated blood sugar increase (The Journal of Nutrition, Volume 142, Issue 5, 1 May 2012, Pages 853–858). Other papers have indicated that lower amylase levels are associated with a number of metabolic syndromes and obesity. Though the mechanisms seem still to be unclear. So the data may support what the MD was saying (though I am not sure whether studies have been conducted specifically on diabetics), but the mechanisms are (to my knowledge) not resolved. 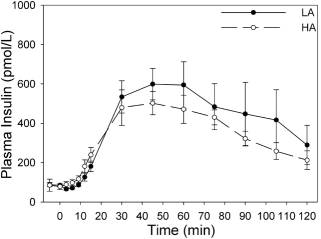 Plasma insulin concentrations following starch ingestion did not significantly differ at any time point between the HA and LA groups when the curves were analyzed over the entire testing session (Fig. 2A). The above graph is Fig. 2A. To me it looks as is there is a clear difference between the two groups so what do you think is meant by what I have quoted from the article? If you look at the error bars you'll note that the range for each group is fairly large. When folks write "significantly" it refers to a statistical test conducted on the data. In this case the means may looks somewhat different, but the data overlaps to such a degree that a test does not reveal a significance in the difference between the groups.